At times, words fail you when you try to describe something that is very close to your heart. I feel the same when I try to talk about Vrindavan. On the surface, it might appear like any other spiritual destination. But, dig deeper and you will find the remnants and the link to a civilization and culture, thousands of years old! 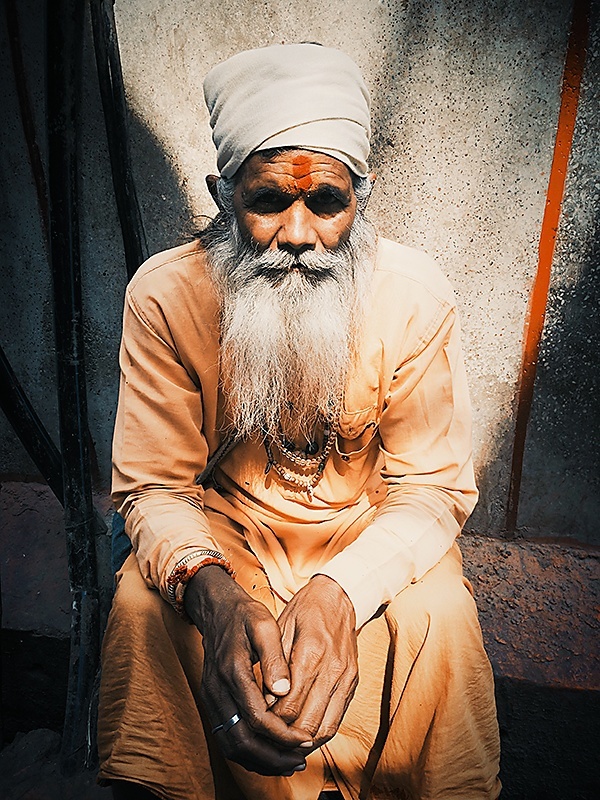 When I�™m in Vrindavan or Braj Mandal that comprises of Vrindavan, Mathura, Barsana, Govardhan, Nandgaon and other places in and around, I�™m lost in another world. Walking down the streets or travelling on the rickshaws while navigating the narrow bylanes, listening to the chants of the localites known as Brijwasis greeting each other with “Radhe Radhe”, the sounds of the temple bells resounding in every corner and the musical kirtan (congregational singing) in the temple halls amounts to a surreal experience to me. 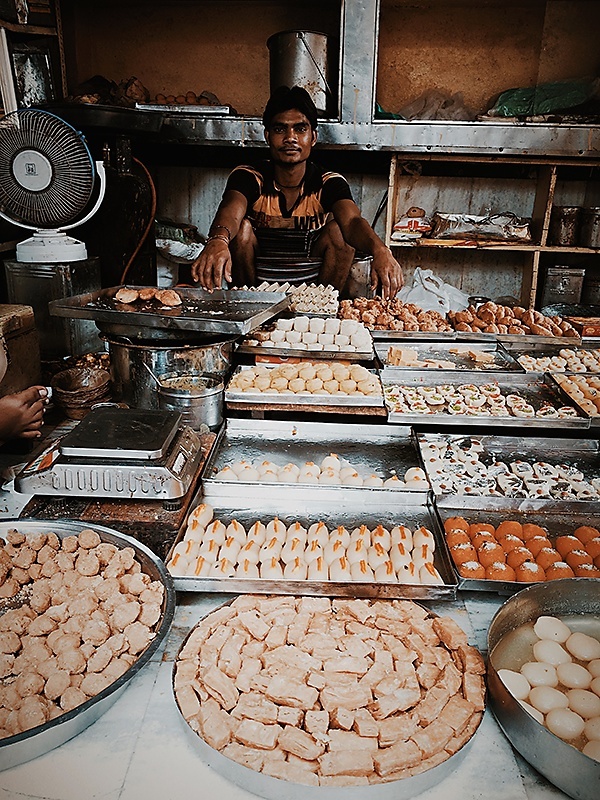 There is no dearth of street fare here and the entire region has a unique specialized vegetarian cuisine known as “Braj ka khana (the food of Braj)”. 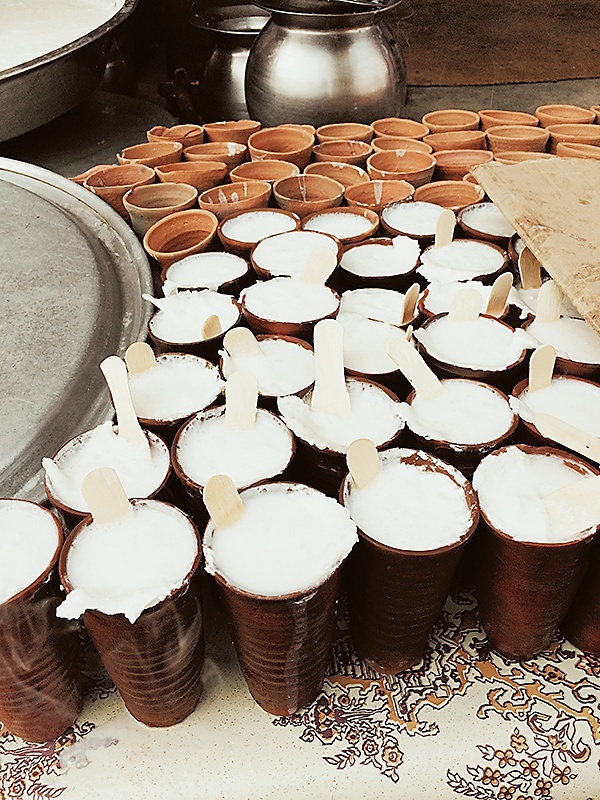 One of the common sights that greets you across the streets is vendors selling sweet lassi, a creamy delicious drink made of buttermilk, laced with fresh butter. 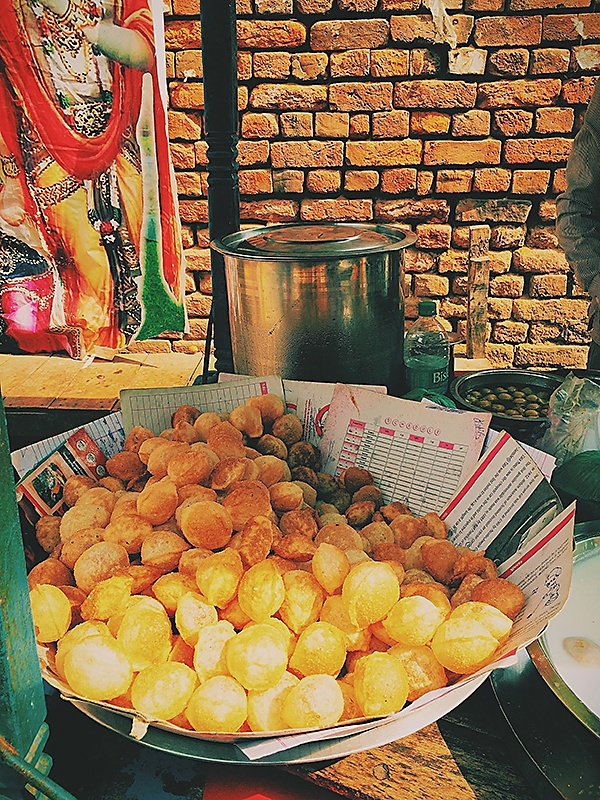 This is truly one of the highlights of the streetfare of the region. 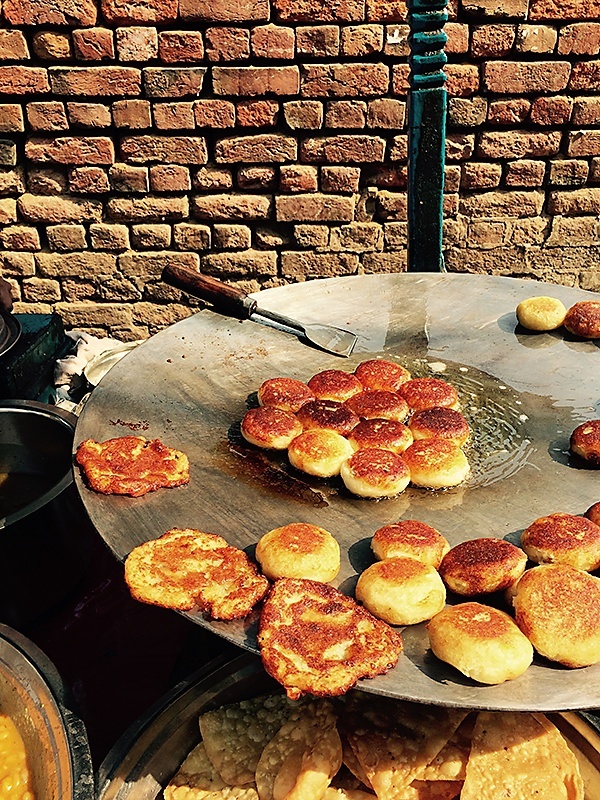 Kachoris, pakoras, chaats and a variety of sweetmeats comprise a significant part of the food sold openly. 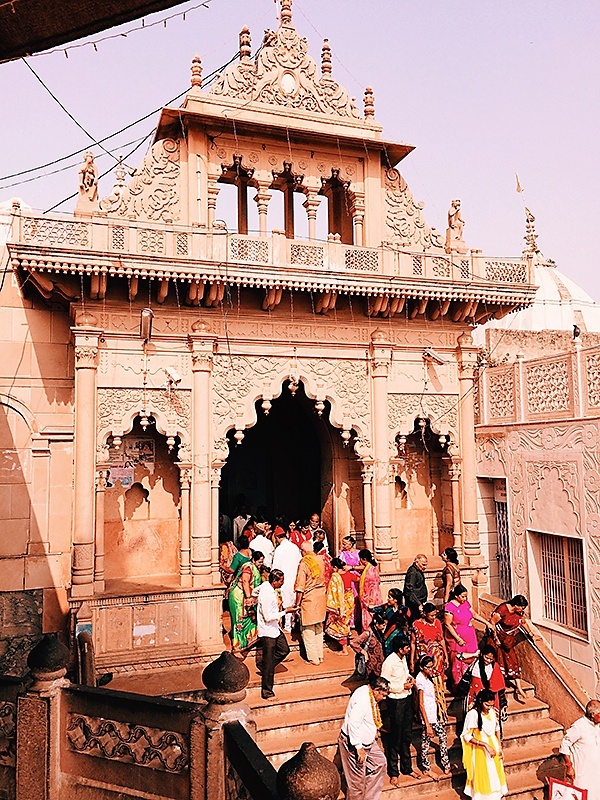 With more than 5,000 temples spread across this space, visiting the prime ancient temples with a history and tradition that is hundreds of years old is another highlight of every visit. And what peaks my interest is the culinary aspect attached to these temples. The temples set up by the Six Goswamiswho were the main disciples of Chaitanya Mahaprabhu are of primary importance and the history attached to these temples has been documented through the years. Ro and me explored many places in Vrindavan when we visited the place during the holy month of kartik in October this year. 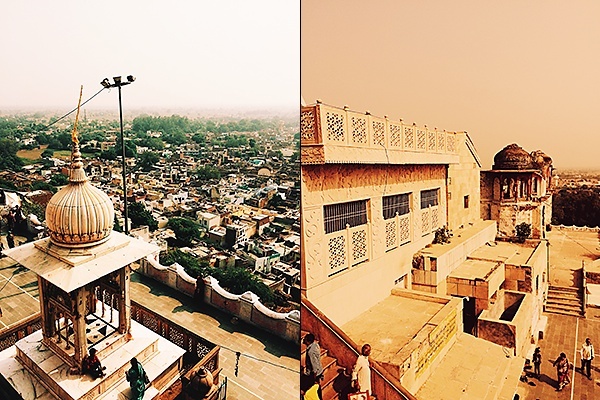 The Radha Raman temple is one of the oldest temples in Vrindavan where the standards of worship are known to be the highest, preserved and passed down through the generations. 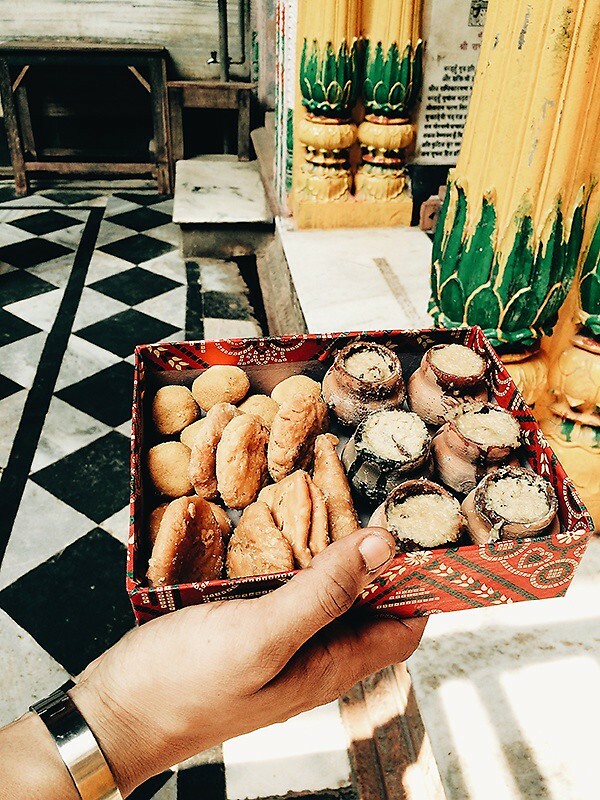 The Gosvamis (family priests) of this temple are known to be very generous and whole heartedly distribute the nectarean Prasad to all the devotees that throng the temple. 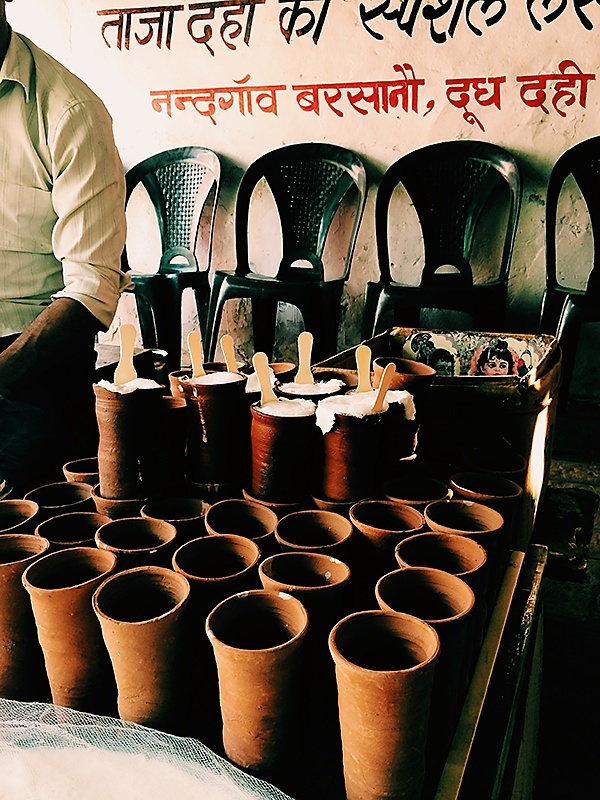 Fifty six offerings are made to Lord Radha Raman every day cooked by highly skilled cooks in the temple kitchen whose families have been cooking here for generations. Another mystical aspect of this temple are the kitchen fires that have been burning for nearly five hundred years non stop, ever since the conception of the temple. 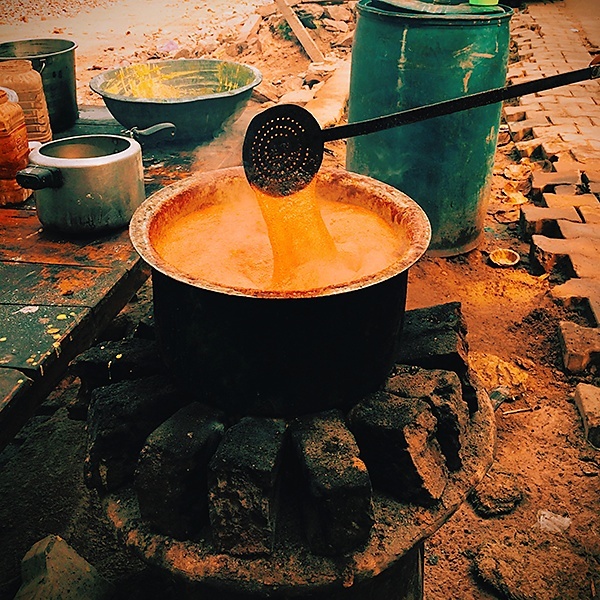 The “kuliya” Prasad, a divine concoction of milk and sugar stirred over fire for hours on end is a speciality of this temple and popular amongst the devotees from all over the world. We had the fortune of tasting many of the Prasad dishes but unfortunately had to miss out on the lunch invitation by the presiding Gosvamis for the maha bhog as we had a flight to catch. 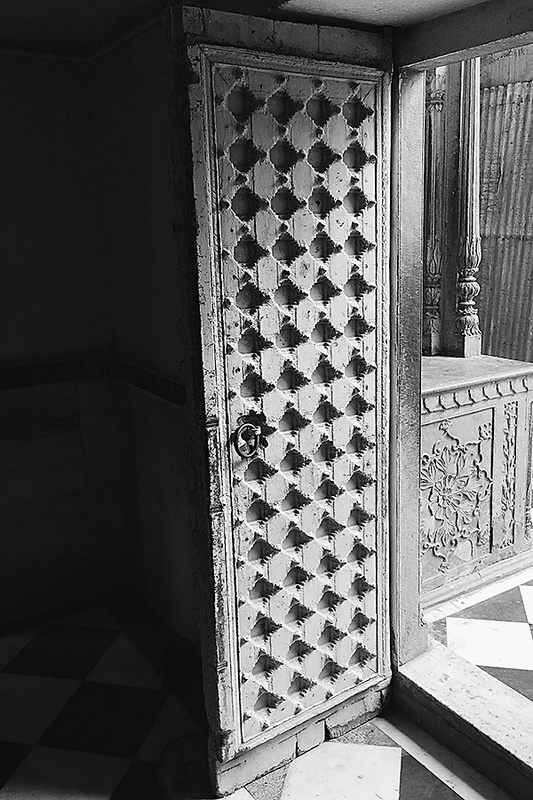 Back in Mumbai, I couldn�™t stop reminiscing about this temple. 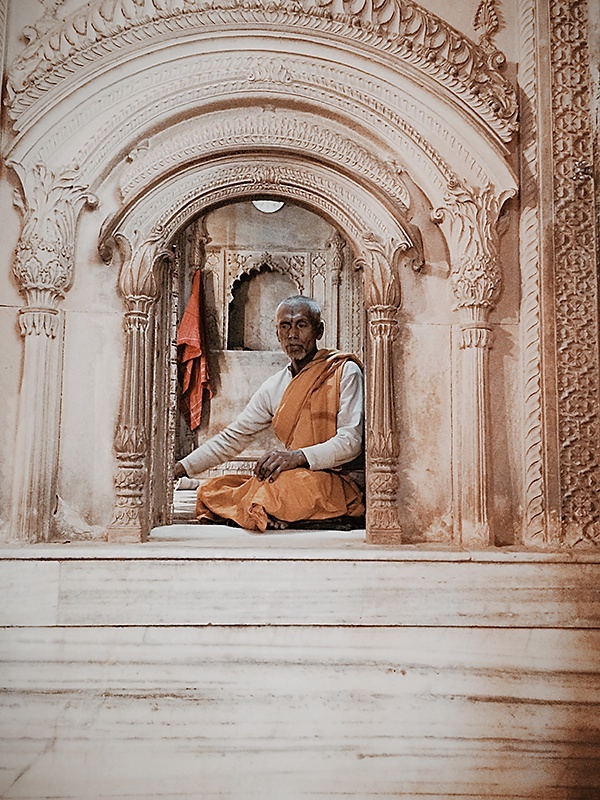 The deity, the pristine atmosphere, the classical music sung in the courtyard of the temple and the bhog or food of this temple, all seemed to have stuck a chord. Then I remembered having browsed through a dish cooked in the Radha Raman temple in Yamuna Devi�™s “The Art Of Indian Vegetarian Cooking”. 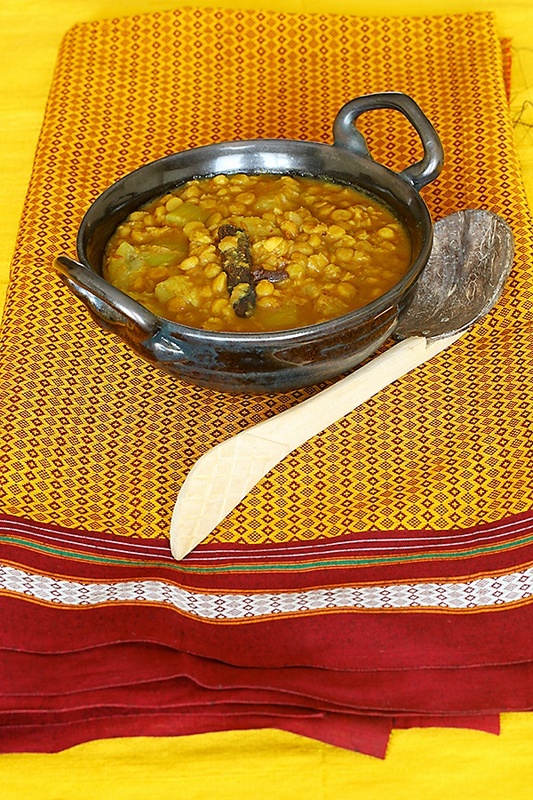 When I looked through the recipe again, I found it to be very similar to the Lauki Channa Dal curry that I made regularly at home. 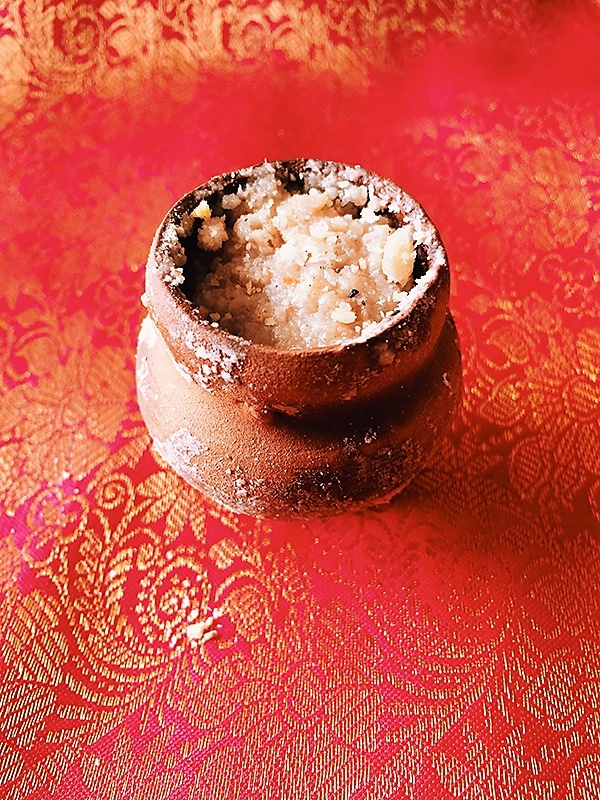 Infact, I was surprised with the similarity of the dish that I made with that made in the temple. Maybe it was an old world deep connect that bound the threads of my cooking with the ancient cuisine of this temple. And it seemed a perfect arrangement that I had a piece of fresh bottle gourd in stock, so I knew what to make for lunch on that day. 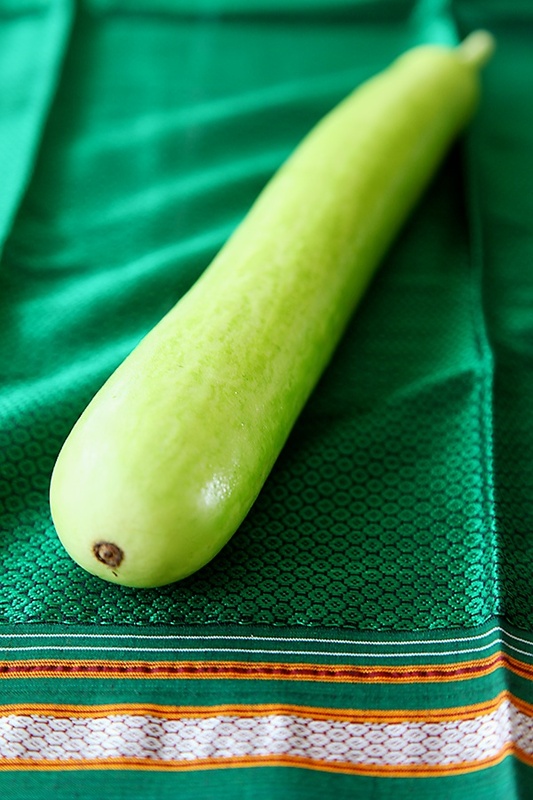 Bottle gourd is one of the few vegetables belonging to the gourd family that retains its shape even after cooking and does not turn mushy. This simple, quick and hearty dish pairs well with rotis or other Indian breads, plain rice and pulao. 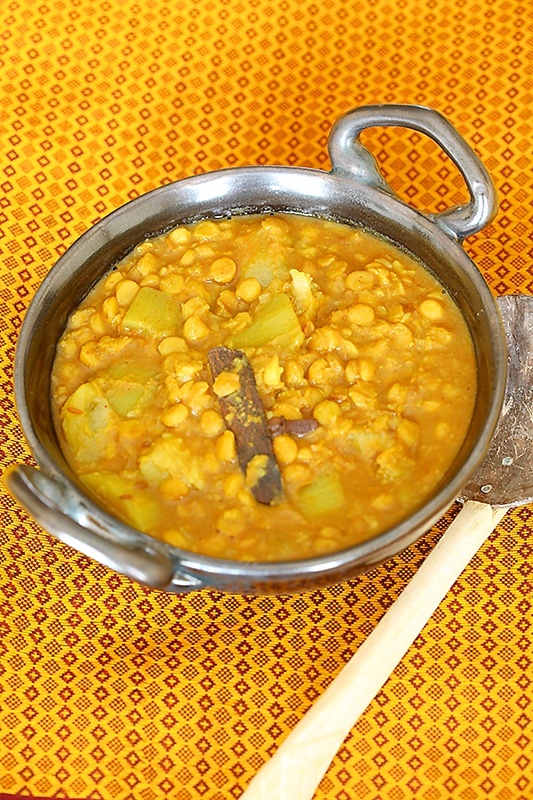 Make sure that you select fresh and tender bottle gourd for this dish. You could replace the bottle gourd with any other squash when bottle gourd is not available. Peel and cut the bottle gourd or lauki into bite sized pieces. 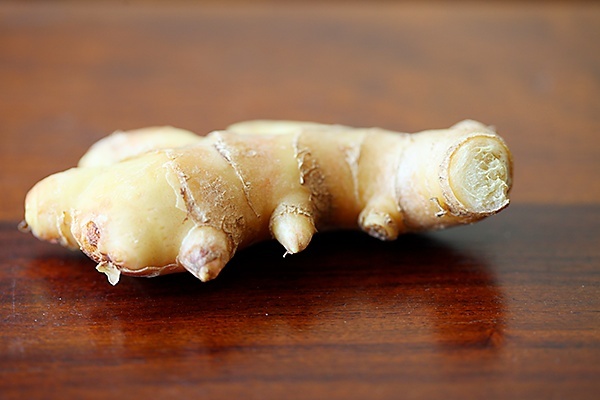 In a pressure cooker or a heavy bottomed saucepan, heat the oil and add the cumin seeds, cinnamon sticks, cloves, hing, ginger, turmeric powder and red chili powder. Stir for a few seconds and put in the bottle gourd and the drained dal. Stir in 1 tsp amchur powder (depending on the tartness, use between ½ tsp to 1 tsp). Add 2 cups water and salt and pressure cook till 1 whistle. 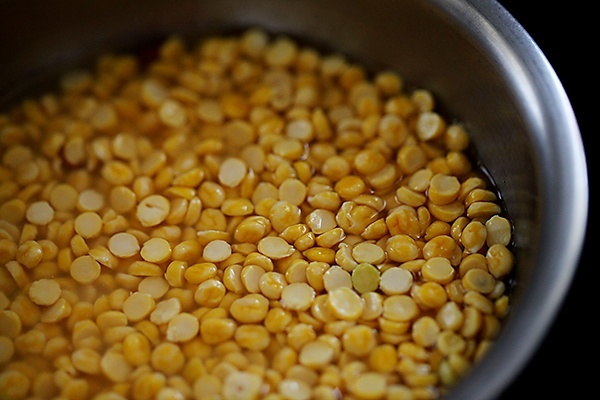 After the pressure is removed, cook the dal a little more on low heat until the desired consistency is achieved. Beautiful post!! 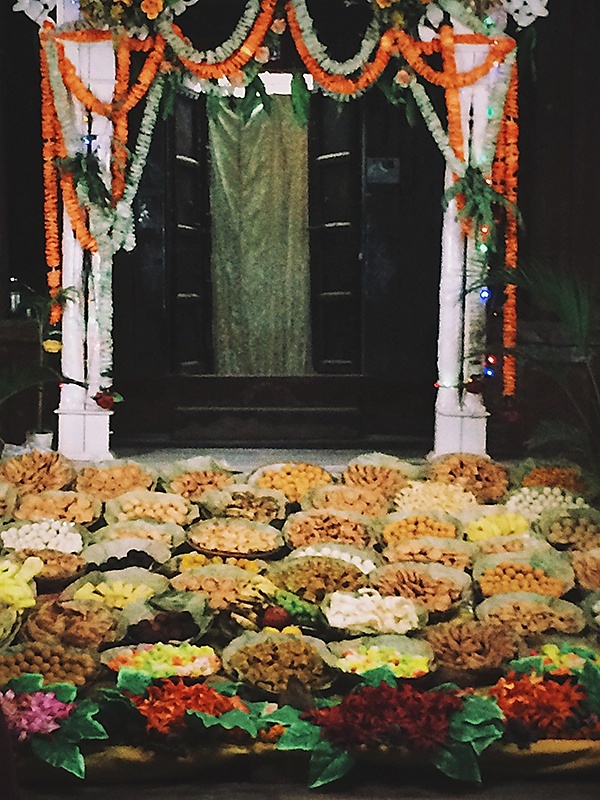 Was very interesting to get to know the food of Vrindavan! When there's a story or personal experience or history associated with Any dish/recipe it takes it to a whole different level. Thanks for sharing. What a lovely post. Got a longing to go to go visit Brajdham again.Gone there a long time back.Thanks for the information too. Will visit the temples mentioned. 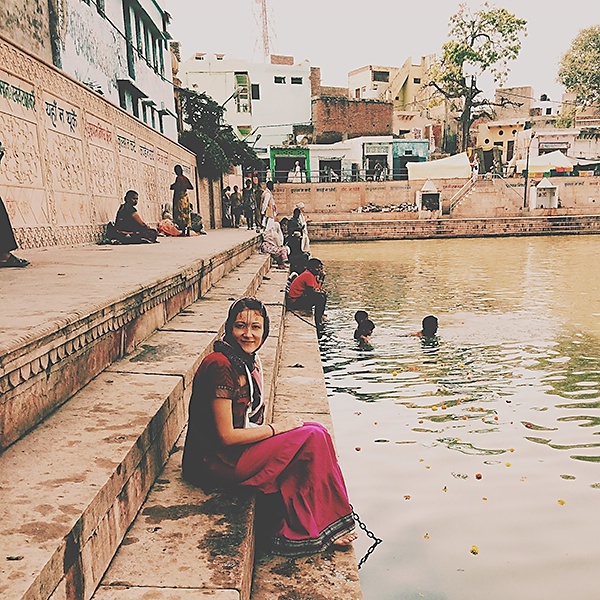 Manisha: I love to explore the historical aspect of temple food. Glad you appreciate it. Shubha: You are most welcome. This is just a tiny fraction of what Brajdham has to offer. Haripriya: I'm so happy to hear that! Its such an amazing experience in its self whenever you share a recipe..Its so more than food!I am so glad that I know Divinetaste which is just not a food blog..Its memories that you share!! Lovely recipe! 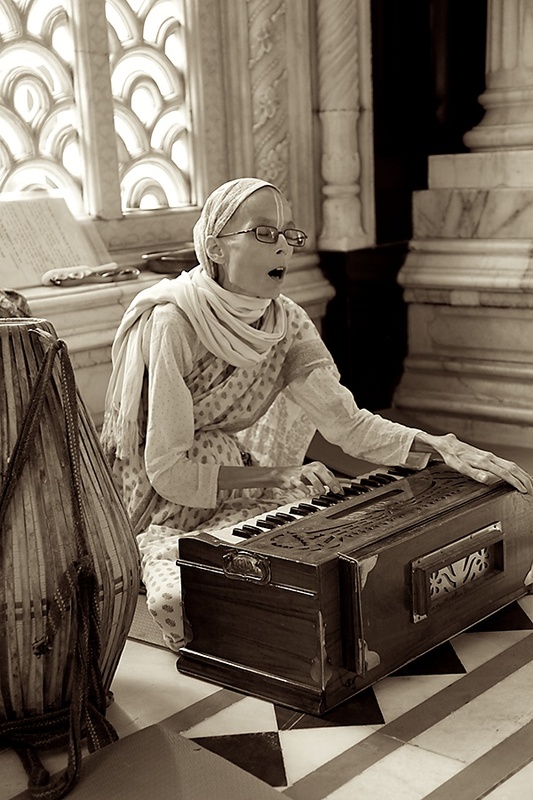 And the fact that you visited Vrindavan during the Kartik/Damodar month is very very auspicious. I am getting to like you and ur site more and more each time I see your posts! Keep it up! Thank you for the wonderful pictures. I was very fortunate to see Vrindhvan and go on Gorvhadan parikirama and visited many many temples and holly places during the month of Kartick. Now, I will try this recipe too. Ruchita- I'm so touched to hear that! Thank you so much and look forward to hearing more from you. Sowmya- Thanks! I was indeed fortunate to be there during that auspicious time. Sita- Nice to hear that. I hope you like this recipe. 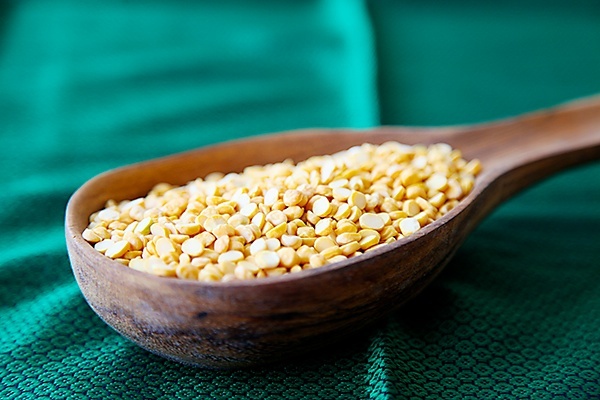 Sandhya- I'm glad I have succeeded in making the humble lauki channa dal look "glamorous". I'm very happy to hear that. ambica- yes..MVT serves good prasadam..been visiting it for years! your bestest post on the site……there are some feelings that cannot be described in words ….so all I can say is THANKS! for this post. 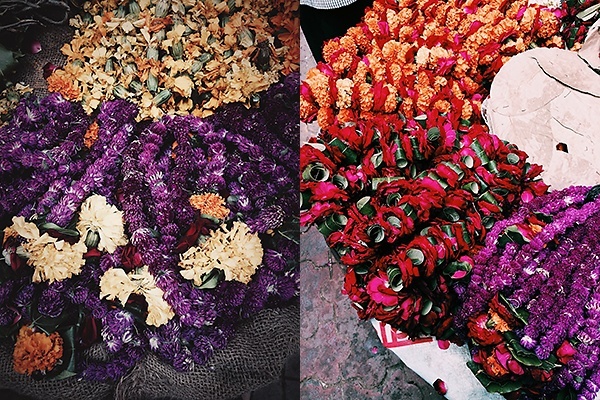 I loved youe pictures of Vrindavan. The flavour of the place rightly captured. I have been there twice and after seeing your pictures i was salivating……!!! And so many memories cam back. first of all let me tell u that when I looked at your photograph, you were looking like Ambica the actress in Malayalam movie. then bit of like Meenakshi Seshadri. Any way, you are looking cute. The post is more cute that you took us to vridavan directly from Mumbai. Lovely post. shall try ur recipe. yesterday only I made the pulikootu with lauki. A fabulous blog. I simply love the exquisite touch you give to each recipe. We had recently visited this place and tasted this dal. It was awesome. Radhey Radhey !Receipe was awesome. Thanks. 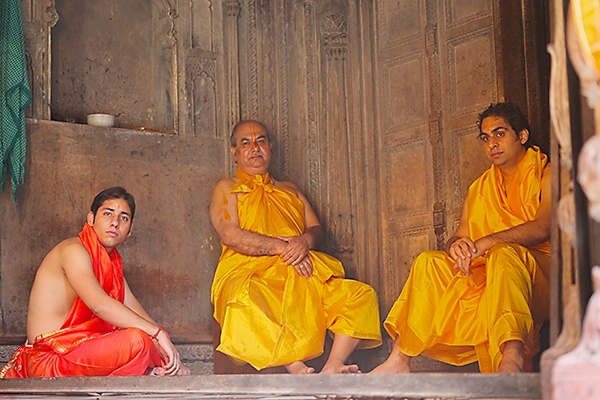 We are going back to Vrindavana in a few weeks. Can't wait to get darshan of Radha Ramanji. Do you have a receipe to make eksdashi receipe to make Roti with a combination of eksdashi safe flour? Made this for lunch today.. Simply delicious.. Thanks for a simple yet flavourful recipe..
And,may you let me know where I can get kuliya in Radha Raman temple and Prasad also and sewa amount if any. 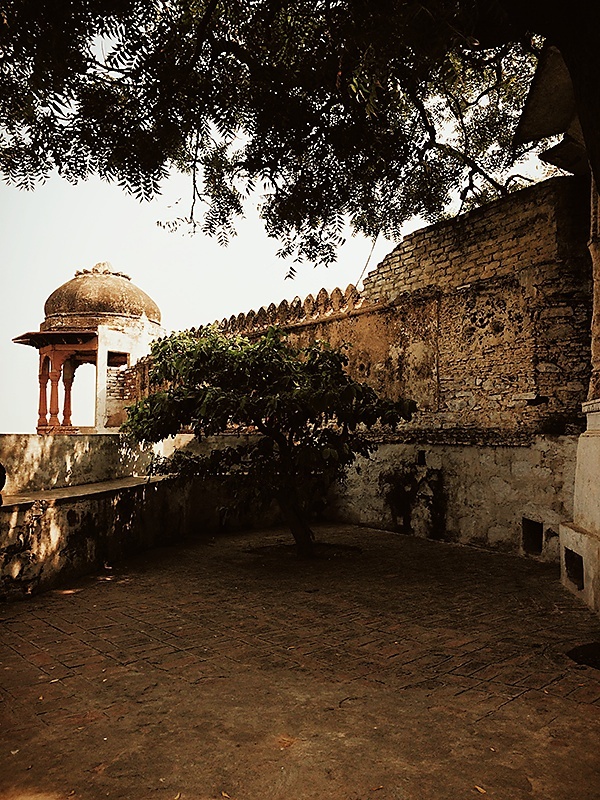 Please let me know the pristine places of Vrindavan .I want to go there please guide me . Aakash- Thank you! You can ask for Kuliya prasad and any other information, from the priests in Radha Raman temple. 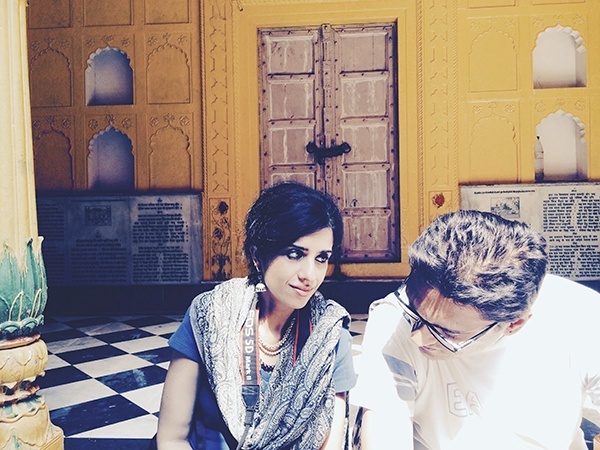 Aakash: You can go to the 7 important temples of Vrindavan. You can google for the same. 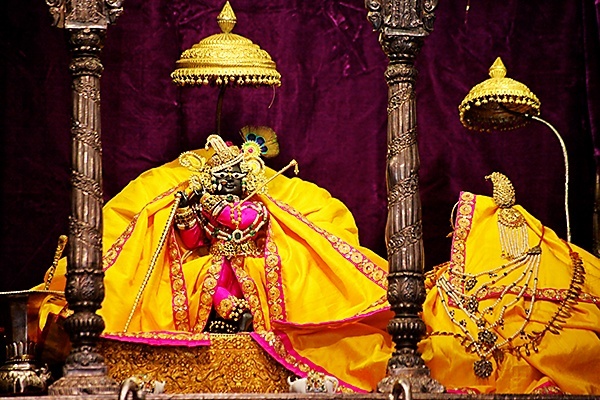 Apart from this you can also visit ISKCON temples. I prepared this a couple of weeks ago and it was so truly divinely tasty. Thank you so much for sharing this delicious recipe. Enjoyed the simplicity. Today when I came to your website I noticed that there is a mismatch in the ingredients and method section. I am not sure if I have missed something. (b) should I use coriander powder. Adding or not adding coriander powder, which will make it tastier. yes, you should add both the powders. Coriander powder will make it tasty.